Whereas previous research concentrated on articulating what global strategies look like in large multinational companies with decades of experience in operations abroad, The Leap to Globalization focuses on how globalizing is realized over time in companies that start from a narrow geographic base. Three characteristics differentiate globalizing as observed in current practice from simple international expansion. First, globalization implies a redefinition of customer value; second, globalizing is an entrepreneurial process that transforms the company; and third, speed plays an essential role in globalization. Harry Korine is assistant professor of strategic and international management at the London Business School. Pierre-Yves Gomez is professor of strategy and director of the Rodolphe Mérieux Foundation for Entrepreneurial Management at the École de Management de Lyon. 1. 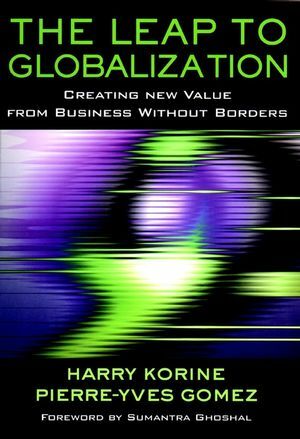 Understanding the Value in Globalization. 2. Facing the Risks of Globalization. 3. Projection: Acting "As If " Global. 4. Absorption: Tackling the Risks of Globalizing. 5. Harmonization: Adapting to Changing Risks Over Time. 6. The Leap to Globalization: A Synthesis. Conclusion: The Future of the New Globalizers.